Take a look at the different types of awning fabrics there are. When you have an awning installed on your home, it’s important to consider some key factors. Some of these include placement, design, and purpose. However, another essential factor you should consider is the type of fabric you should choose. While this may seem purely cosmetic, you should know that the different types of awnings all come with different physical characteristics that determine how they’ll function. Here are 3 awning fabrics you should consider before having your awning installed. These awnings are usually the most common;y chosen ones, and for several good reasons. First, it is the type of fabric that has been used for the longest amount of time. For about fifty years, people have used canvas as the material for their awnings. 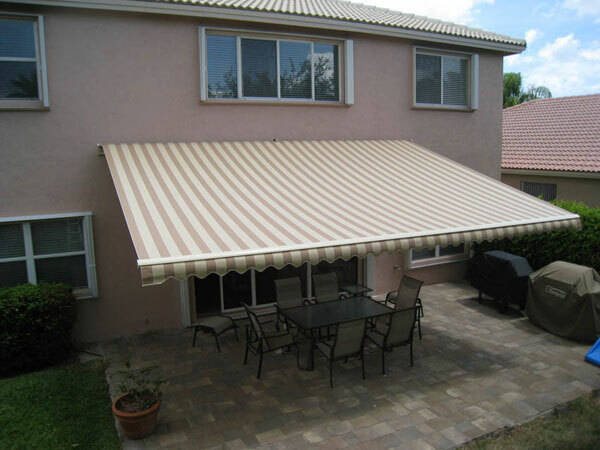 Canvas awnings are made with natural fibers, so they are excellent at regulating temperatures. This means that during those hot summer days, your home or business will be protected from the Sun’s harsh rays. These awnings are highly customizable too, so you can get one to fit your overall design scheme. When you invest in a mesh awning, it’ll be made of PVC, a material that is resistant to fading. This is an important feature to keep in mind as it relates to maintenance, so make sure to consider it. Also, if you’re planning to use your awning to block sunlight, you’ll likely want to look for a type other than mesh. However, if you’re planning to use an awning around a pool or somewhere you’d want to see, a mesh awning is a great option! Acrylic is the lightest awning fabric there is, making it an excellent option if you’re planning on having a retractable awning. This type of awning will let a significant amount of light through as well, so keep that in mind. Acrylic awnings won’t be as effective at blocking beaming sunlight as canvas ones would be. These awnings are highly customizable though, so if you need an awning for a purpose other than blocking sunlight, acrylic awnings might be the right ones for you.